Even today, boats don’t come alongside Hirta’s coasts except in summer, when the weather makes it possible. After sailing for hours, the island of the Northern world finally appears and the most audacious make their way through to Village Bay, the place the more sheltered of the area. During the XIXth century, the extreme isolation of Hirta’s inhabitants reduces, due to more and more frequent contacts with the continent. And this causes a fast decline of the community and its way of life. First of all, the arrival of religion leads to the first irreversible transformations. From 1705, a missionary called Alexander Buchan settles a few times in St Kilda, hoping the community will walk on the path of faith. This first try is a biting failure. Things changed with the arrival of Reverend John Mac Donald in 1822. During his regular stays on the island, the ecclesiastic creates a real friendship with the islanders who are really sad when he definitively leaves in 1830. Indeed, mandated by the Scottish Church, Reverend Neil Mac Kenzie comes after him and lands on Hirta the 5th of July 1830. He quickly establishes himself on the island with a clear intention to improve the inhabitants’ living conditions. On the programme: agriculture reorganisation, village reconstruction, building a church and a presbitary. 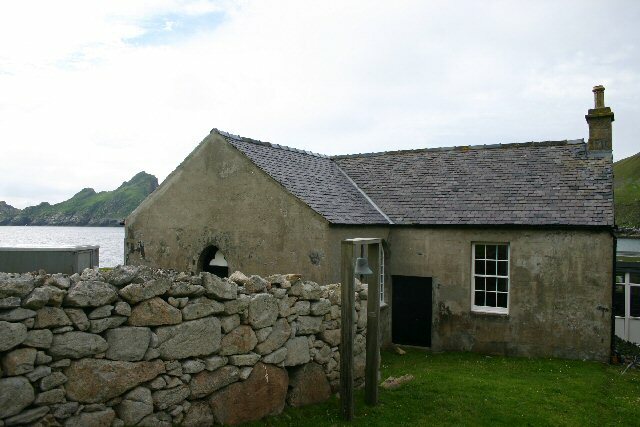 With the help of the Gaelic School Society, the offical education is added on the island: reading, writing, arithmetic and religion courses form the pattern of the islanders’ timetable. Main street of Village Bay during the 19th century. When we think of all this, we can’t help seeing the images of colonialist periods, when the European were convinced to bring “civilisation” to “primitive” men, but also the evangelism periods which came after the conquest of the New Continent. People of St Kilda are like those “noble savages”, mythic image developped from the XVIth century. A “young humanity” (in opposition to the old one, in the Old Continent) which is not corrupted by vices of the modern world yet, a “young humanity” whose ignorance and authentic link with nature make them pure and innocent beings…. Christianism brought to them by missionaries. Because those “noble savages” were offered by God to give a chance to restructure humanity cleared from its dark sides. Paradise lost, the Garden of Eden, the Eldorado really exist on earth, so now, all is needed is to bring “true” religion. For the islanders, the most difficult starts after Mac Kenzie’s departure and Reverend John MacKay’s arrival (still mentionned here) in 1865. He adds then, very strict rules on the island, especially demanding a compulsory attendance to the Service. Those religious meetings deeply modify the customs of Hirta’s inhabitants. The fragile balance in St Kilda basically rested upon this. For more than twenty years, Mackay applies a real psychological pressure on the islanders who are regularly sermonised. Thus, in 1875, Sands, a visitor writes in his logbook: “Sunday is a day of unbearable sadness. At the sound of the mournful ringing, everyone rushes into the church with a sad expression, looking down. Mackay considers as guilty anyone looking to the right or left.” His reign will last until 1889. The regular presence of tourists on Hirta also contributes to transform deeply the inhabitants of the island. They had only occasional contacts with the continent and now, they have regular contacts with steamboats and their passengers who come and observe those weird people who live far from the world and modernity. Tourists bring money as well as unknown illnesses in the archipelago, as tetanus which struck many children. How can we imagine the feelings created by those humiliating meetings? 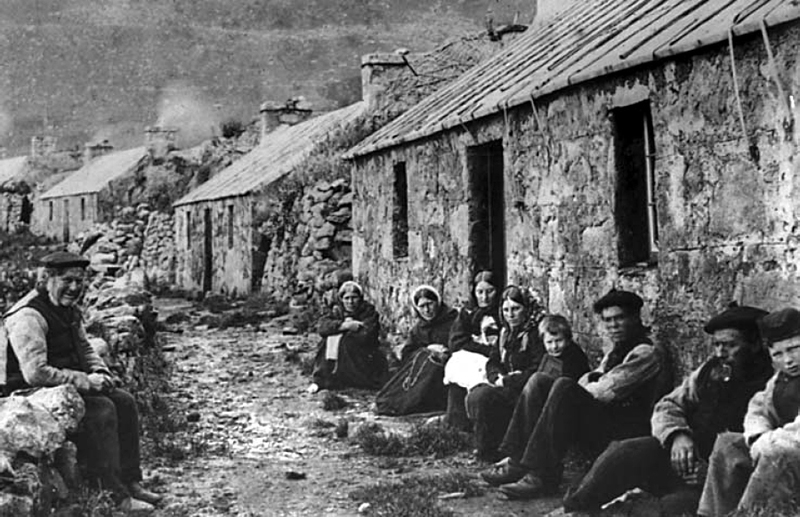 However, some young islanders take advantage of the steamboats to leave Hirta, searching for a better life, far from privations and Reverend Mackay. Without any doubt concerning the cruelty of the New World they will meet, and for that, they were not equipped. School and church. St Kilda, photo Bob Jones. Finally in 1906, the “official” education taught by the successive reverends puts down new roots with the layout of a school next to the church. The community, affected by deep modifications of its way of life and its connection to the world, was not going to resist a long time to the siren songs of the continent. Less than a quarter century later, the ancient occupation will end. Tags: end of St Kilda, Kilda project, Kilda projet, St Kilda history. Bookmarquez ce permalien. Previous post ← Projet Kilda : la bande-annonce officielle !